Sustainable Developers, sustainable, neo-traditional, infill homes. Fountain Inn's Most Distinctive Address Retail/Office Space and Loft Apts. 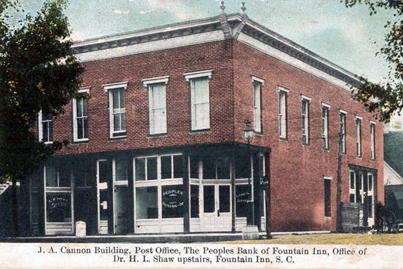 Known as the Cannon Building, 100 North Main Street is one of the most architecturally distinctive properties in Fountain Inn. Constructed in the late nineteenth century, it features decorative metalwork on the exterior and original hardwood floors and tin ceilings on the interior. It was recently listed in the National Register of Historic Places because of its architectural and historic significance. 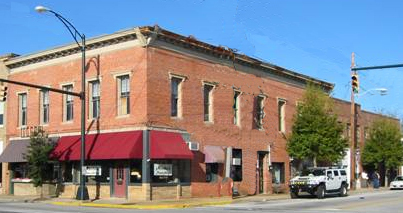 Inspired by the architectural character and positive downtown revitalization of Fountain Inn, 100 North Main, LLC is rehabilitating the historic Cannon Building into a mixed-used development with commercial/retail space on the ground floor and two private apartments on the second floor. The rehabilitation will follow the Secretary of the Interior’s Guidelines for the Rehabilitation of Historic Properties and will respect the unique architectural character and craftsmanship of the building. The original storefronts will be reconstructed on the first floor to provide an engaging pedestrian experience. Metal ornamentation will be preserved and enhanced on the exterior. Refinished hardwood floors, tin ceilings and plaster walls will add to the interior charm of this distinctive building. The first floor will accommodated two - three commercial/retail spaces, each with excellent exposure. The primary space is approximately 1250 square feet fronting on Main Street with a second retail space available with approximately 1100 square feet. Two large apartments – 1420 and 1376 square feet – will blend contemporary floor plans, historic materials, and upscale interior finishes. Each apartment will feature a private entrance, two bedrooms, two full baths, kitchen, living/dining room, laundry room, and abundant closet space.